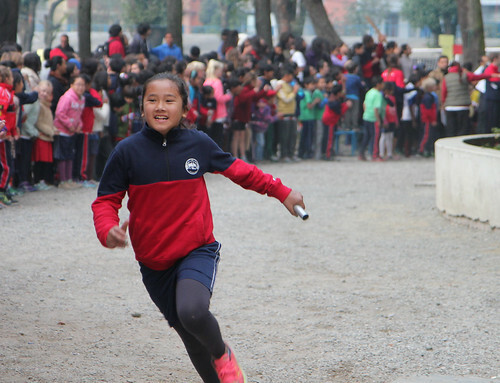 Home TBS News and Calendar School news Makalu capture House Relay trophy! Makalu capture House Relay trophy! This terms' house event was held on Tuesday and there was a air of great anticipation for the very exciting House Relay. Prior sprint trials and training ensured the runners on the day were fit and ready to represent their houses. A huge crowd of parents and students cheered loudly throughout the event. The EYKS1 races were held on the primary astroturf and the KS2 & Secondary races consisted of a lap around the school grounds. The competition was neck 'n neck, up until the final race when the Secondary boys from Makalu crossed the finish line in first place to capture the house trophy. Annapurna took second place with the remaining two houses placed in joint third position. Well done to all the runners and supporters!